Last week my wife and I were in the mood for a pizza. Not the typical fast food pizza but a unique pizza from local pizzerias. 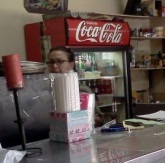 This is when a friend of ours who lives in Guadalupe, Costa Rica told us about this new pizza restaurant in Guadalupe called, “Bar y Pizzeria Jacaranda. Located at the intersection of La Robert de Guadalupe and Alto de Guadalupe, this new and little known pizzeria is offers some of the best pizza in Costa Rica at unbelievable prices. At first glance, the pizzeria does not seem like much since it is located in a corner of a small plaza with no name with only a small sign to let people know where it is. True to Costa Rican ingenuity for saving on space, the pizzeria is three stores in one combining a bar a pizzeria and a milkshake store called, B@ti2. As my wife and I entered, we were greeted by a smiling lady in her early 50s that was happy and eager to explain to us the several types of pizza and Italian dishes available. 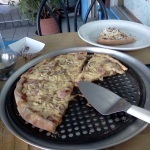 We went with a medium size pizza called the “Carnivora” which cost only ₡6.000 and was large enough to feed 4 people. Along with our pizza we decided to order a couple of strawberry and mango milkshakes. The 15 minute wait for the pizza was pleasant enough. We sat on a miniature terrace in front of the restaurant which was far enough from the street as not to smell the gasoline smell from the cars passing by but not far enough as to block out most of the noise from the cars. We could have opted to sit inside the restaurant but it was such a beautiful day that we chose to enjoy the sunny afternoon in Guadalupe. The pizza finally arrived and we were pleased with what we received. It had a great presentation and the taste of the pizza was amazingly delicious. We were very surprised at how good the pizza as it had a taste of Italy mixed with a slight taste of Costa Rican cuisine. Needless to say, we finished the whole pizza and we will definitively come back to this great hidden pizzeria in Costa Rica. 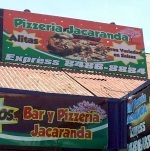 I give this Bar y Pizzeria Jacaranda 5 stars and I am proud to recommend it to anyone and everyone.